Jes Guesthouse i Goa, India: Bestill nå! Jes Guesthouse is owned and managed by the friendly and charming young Pereira couple, Damasceno and Rufe, and their young 2 daughters, who live there. For the guests they have 5 spacious separate rooms, each having its own independent private balcony to view the lush green beautiful palms outside. There is also a guestroom with kitchen and balcony on the ground floor. Living just below the Jes Guesthouse, they are able to provide prompt and efficient service to their guests. 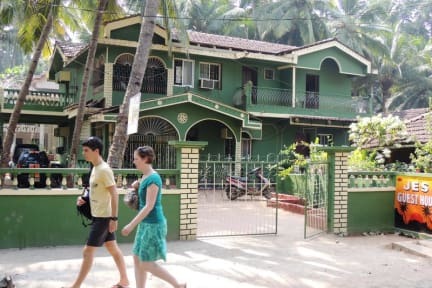 Being Goans, one is guaranteed to be pleased by their Goan hospitality and friendliness which is second nature to all people of Goa. 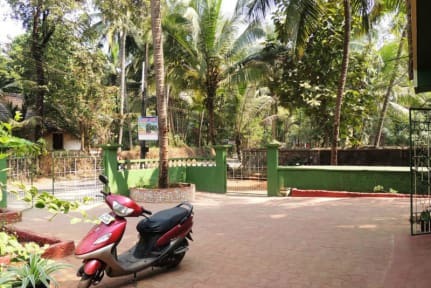 Jes Guesthouse is located in a very quiet and appealing beach village of South Goa called Majorda Beach, just 5 minutes walk away. The guesthouse is surrounded by tall lush palm trees.